New England clam chowder is so rich, creamy, and delicious. My son loves this soup as much as a dessert. I had to limit him to one bowl a day and when he took it to work the next day, he came home again and reminded me how good it was. He works hard and I know things taste even better when you are extra hungry. And if you read the ingredients in this New England clam chowder, you will know why this tastes so good. If you are looking for a heart healthy soup, I don’t recommend this, but if you are looking for the most amazing flavor ever, this is the one. i got this New England clam chowder recipe from a friend of mine; he has now passed away. Making this soup brings back fond memories of him. Food has such an impact on our lives and so many memories are associated with food. I am so grateful for friends that will share their amazing recipes and talents. I know that there are some who won’t, and they even take their recipes to the grave with them. How do I know this; yes, I had a friend that did that too. That is okay, I think that I have enough recipes that I won’t miss one. So much good food, so little time. This soup makes a lot and so if you aren’t cooking for a herd like I am right now, you might just want to cut the recipe in half. I have never had enough to try and freeze it, but some day I will have to try it and let you know how that turns out. I don’t see why it wouldn’t. And if you don’t mind leftovers, then this is great for that, as well. This is the perfect dish for today, we have been having rain all night, and it is dark and dreary outside today. This is going to be a wonderful warm comfort food today. And just like Campbell’s says “soup is good food”. I’m so excited for you to make this and let me know how much you love it . I’m telling you, you are going to be a lot happier with this recipe than any chowder that you have ever eaten. Enjoy! In a very large pan or cooking pot, using 1½ Tablespoons of bacon fat and 1 teaspoon of olive oil, saute the diced celery and onion. Add fresh garlic and sauté for 3 - 4 minutes on moderate heat. Add basil, thyme, oregano, Lawry's salt, garlic salt, onion salt, pepper, and Old Bay seasoning, one at a time, stirring gently. Add chicken broth and then potatoes, with all the reserved clam juice and simmer on medium; boil until potatoes are tender. Add the warm tap water, then add Worcestershire sauce, lemon juice, and a few drops of Tabasco sauce. Add parsley. Simmer for 3 minutes more. Add drained clams. Stir well. Add cream and half and half. Bring to almost a boil, then add the premade roux with a wire whip until well incorporated. In a medium pan, melt butter and add flour and oil, stir until well blended, this will be thick. Remove from heat. Use this above. 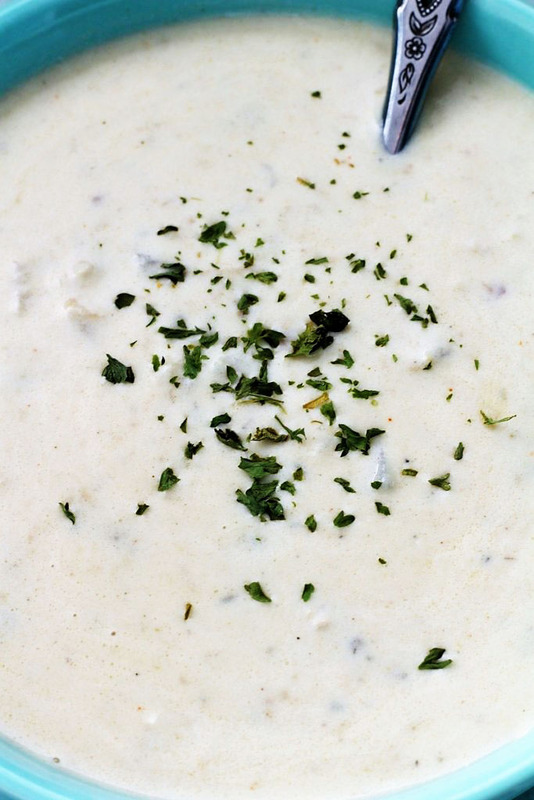 You do need to share it with her if she likes Clam Chowder because this recipe is a keeper.